Catch up on Rudi’s first post here. Rudi is looking for his forever home, meanwhile he’s living life with me, Mick & Romeo. I would be very happy to find him a good home, so please contact me if you are interested. Rudi is itching constantly! I find tiny ticks all on his ears and a few others on his body. His ears are half hairless due to all the picking I did. He was so patient, I worked on him after a long walk and he was tired, so that helped a lot. He is very compliant and watches my 2 dogs for what to do. Everything is new to this dog; I perceive that he hasn’t experienced much in life. He’s afraid of getting in the car, turns into a pancake, so I lift him gently and put him in the car. Just be patient I tell myself. He gets excited and nervous to have his harness and collar put on. So we are not getting them on, and then sitting for a treat. Anytime you ask for calmness and reward that you will get more of that. It takes me being calm to, so I am reminding myself that also. Lots of happy talk, not getting mad or frustrated is the key to keeping associations good for things like putting equipment on dogs. 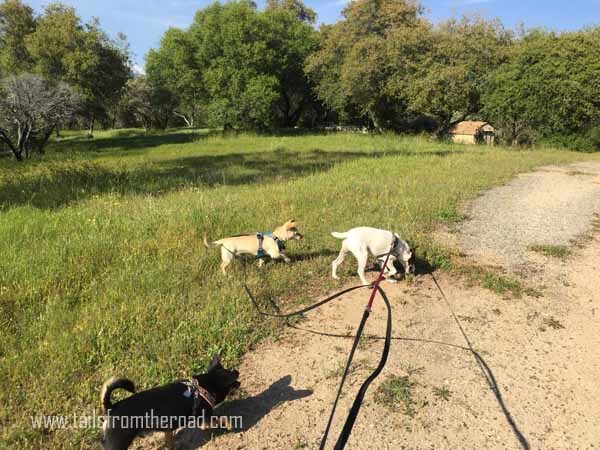 Car ride – Took the dogs for a ride into Coarsegold and Oakhurst, just to see what’s around. Got out and took a short walk in a park, got back in and I stopped for lunch. Got the dogs some ice cream and split it 3 ways, had them eat it in the car. So Rudi is getting some good stuff in the car. Then we drive home and they hang outside for a while. Rudi’s first motorhome ride, here he is! Yay, he’s a great traveler! Took the dogs to the dog park and 20 minute walk, and then worked until Noon. Nice day, Mick and Rudi sat outside on tie outs in the sun. We headed up to a lake to find a trail, didn’t find a trail, but a closed campground which we walked all over for 1.5 hours. I was able to let my dogs off leash and have Rudi on a long line so he could explore. The dogs had a great time. Gave all three dogs a bath, Rudi got a Wondercide soap bath; this is a cedar oil product to kill fleas/ticks. Then I did another tick searching session, found a few more. I set up Rudi in his own bed on my bed. He seems to like having his own spot; he’s trying so hard to fit in with my dogs. Mick is being pretty nice to him, Romeo is totally ignoring him. Rudi, Come, treats. If I deliver several tiny treats then I get more attention from him. Sometimes I deliver 1 treat, others 3 or 5 treats. Mix it up. Lots of verbal reinforcement, good dog, good Rudi, sweet soothing voice. My goal is to reinforce Rudi with verbal praise and sometimes treats for getting things right. I don’t want to be yelling “no” all day, so I redirect when he needs that. Such as putting on his harness, this brings about excitement/anxiety for him, so I have a treat in one hand and get the harness over his head with the other. I hang onto the treat so he is chewing on it, but not really getting it. Then I deliver the treat and clip the harness. It keeps him more focused and more still for me. Soon I’ll be able to drop the treat. Coming up the stairs into the motorhome has been tough for him; I don’t think he had experience with stairs or jumping up on things. So he is learning how to use his body in this way. So when I want the dogs to come inside, I give them a little treat. This gets more of what I want and they love it. Rudi’s itching is subsiding. I’m hoping he is bug free now ad his skin can heal. 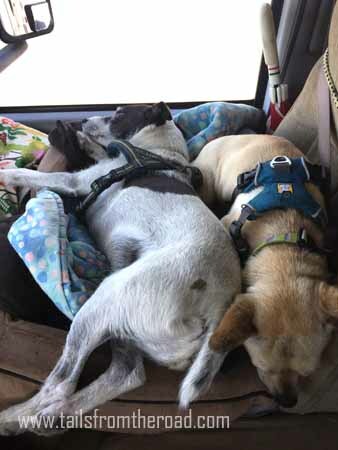 Raining all morning, got out for a potty run to the dog park, dogs were all sacked out til 1:00pm. We had a nice 1 hour walk around the RV park which is very hilly and full of greenery, trees, squirrels and rabbits. The walking of 3 dogs on leashes it tough, but it’s getting a bit easier. Rudi was not quite as crazy on the dirt path today. He’s so aroused, I am asking for him to come to me every few minutes, success most of the time. Treats for coming. Rudi stole Romeo’s chew and then would not give it to me. He growled and had the whole thing in his mouth. I tried trading out for a treat, but he wouldn’t do that. I’ve learned, it’s not worth getting bitten over, so I let him win this battle. It was a note to self, must work on sharing! So here’s what I’m going to do in the future. It’s natural for dogs to guard things, this is an innate behavior. So it is our jobs as humans who ask these dogs to live with us to teach them that giving something up is no big deal. So how do you do that? You turn it into a game. You hand the dog a chew, and then you offer him a different one, taking the first one. Trade out! Do this again and again, with similar items and then different items. Can you trade out the item for just a treat? I’ll need to do this every day with Rudi until he is willingly dropping things for me. As he does let go of things, I’ll say my word, “drop it’, and reinforce this with threats and verbal praise. This is a very important thing to teach dogs. There is nothing scarier than a dog who says “this is mine”. I’ve been feeding Rudi what I feed my dogs, which is something different each meal, but a lot of Sojos freeze dried raw food, mixed with some raw meat; some meals are raw food that’s been frozen or a batch of chicken stew that I made for the dogs. I’ve been pleasantly surprised that he has done great eating all of this and has great bowel movements. No issues at all. I noticed that he looked a little thin, so I’m giving him more now. Rudi wanted to pee on everything! Yikes, this was a bit alarming for me at first. I knew this behavior was because he was nervous and unsure of what was happening. I was afraid to let him in my motorhome at first, so we took 2 long walks that first day before I let him inside. No problems inside yet. I remember back when I had a Scotty dog stay at my house and would mark in my house. Arrrrggg! Once I figured out he was just insecure, I rewarded him for good behavior, gave him a lot of verbal reinforcement, and he figured out the routine of the household, he stopped marking. Keeping your eyes on your boy dogs always is key when in a new place. Some are worse than others and all need to be watched when they are in a house that has had other dogs. Yesterday was a big day. 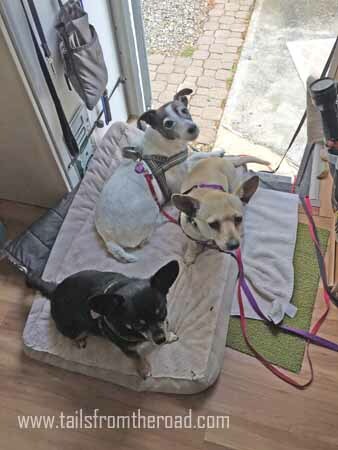 I drove about 3 ½ hours, Rudi did well in the motorhome, but there was a big snark form him to Mick over something, I’m not sure, but I’m seeing some guarding behavior from him. I knew this would happen, when a guest is new at someone’s house, they are quiet and trying to fit in, but after a few days, they start being themselves. I was sure Rudi would show his true colors, and he is. That’s ok, I’ll be working on the guarding, it’s good to know the issues so I can change them. 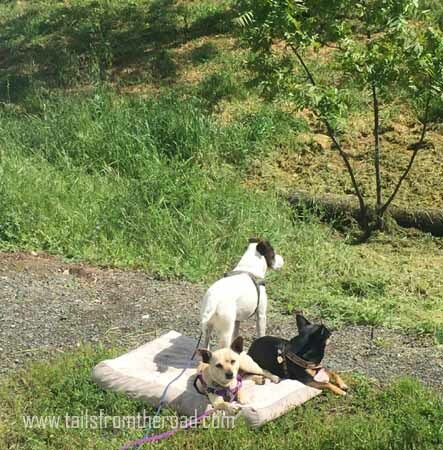 We arrived in the afternoon at an RV friend’s 10 acres in the Sacramento area. Fenced acres that is, so basically doggie Disneyland. The dogs were outside playing, hunting, running, watching chickens and basically having the times of their lives for 4.5 hours when it got dark. Rudi surprised me as he keep a lot of focus on me, came to me several times, and was excited to get petted by Vicki. He did well with her 2 big dogs also, one of them was targeting him (aka stalking, bugging), probably because he’s un-neutered. He handled it pretty well. Mick and Data, Vicki’s young female dog played and ran and Rudi joined in the running. Rudi gave me a lot of focus for just being with me 5 days. So far, I’m impressed with the little guy.